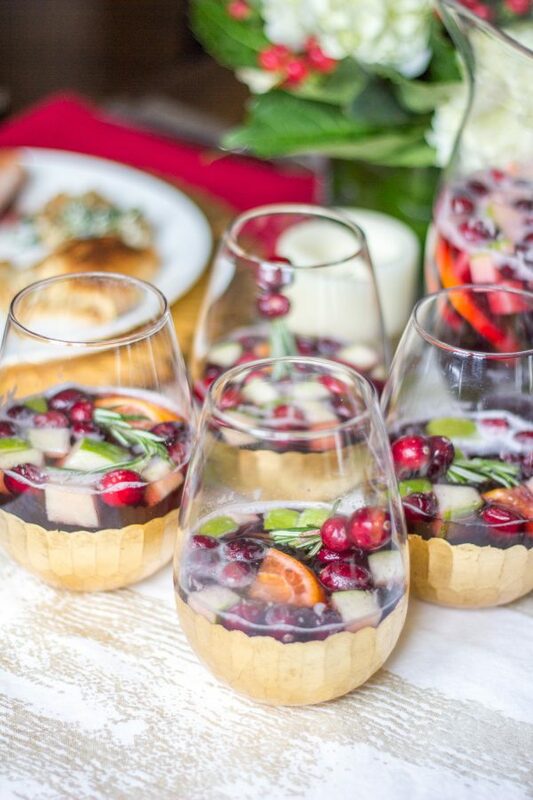 This Winter Sangria mocktail is a delicious alcohol free drink to serve at parties. I have reached the age where I need to serve a nonalcoholic drink option when I host parties. 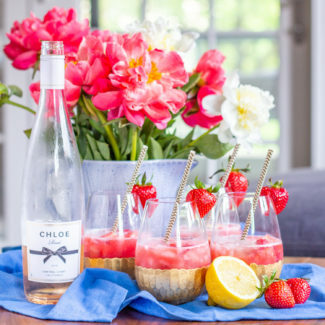 It seems like at least a couple of my friends are pregnant at any given time, other friends have kids, and I want to make sure that all of my party guests have something fun to sip on. 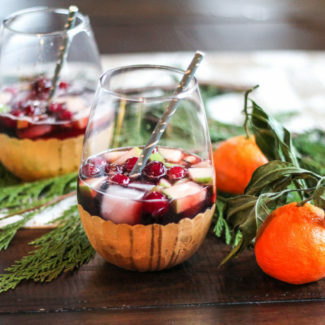 This Winter Sangria Mocktail has a mix of fresh fruits and juices for a bold fruity taste. 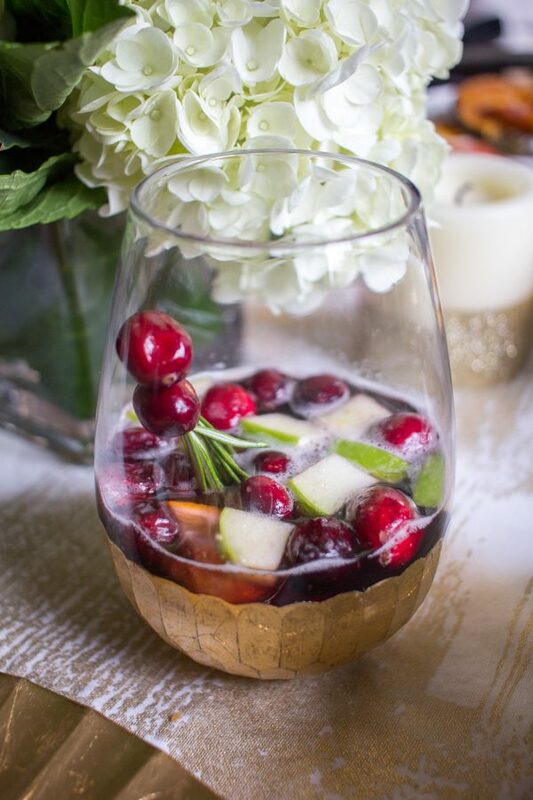 The total preparation time for this winter sangria mocktail is just 10 minutes. 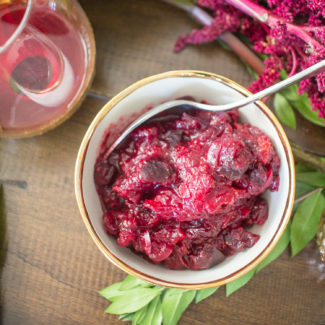 Fresh cranberries get simmered in cranberry juice until the berries burst and the mixture becomes syrupy. 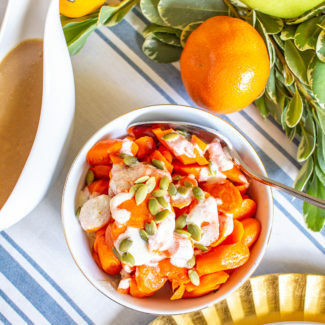 While the cranberries simmer, you slice up an apple, and an orange. 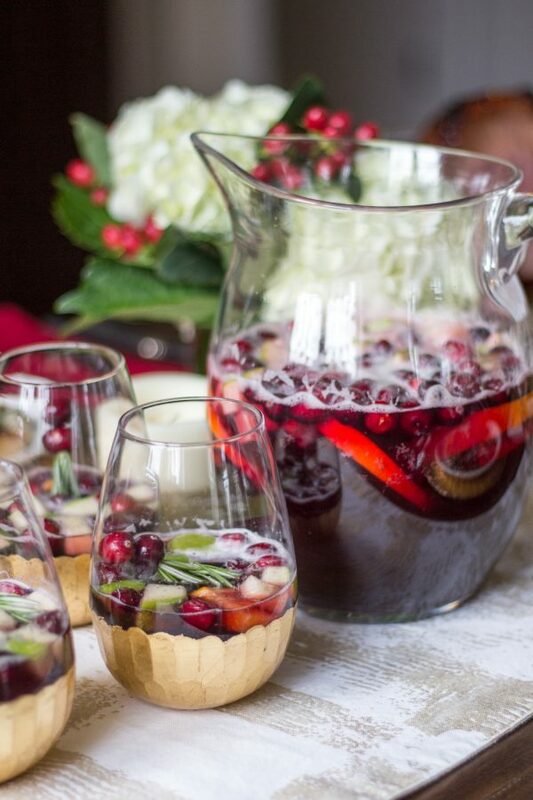 Then the cranberries, apples, and orange get add to a pitcher and you add pomegranate blueberry juice, apple juice, ginger beer, and more cranberry juice. Add some ice and stir, and you are all set! I added a quick garnish of a couple fresh cranberries on a sprig of rosemary. 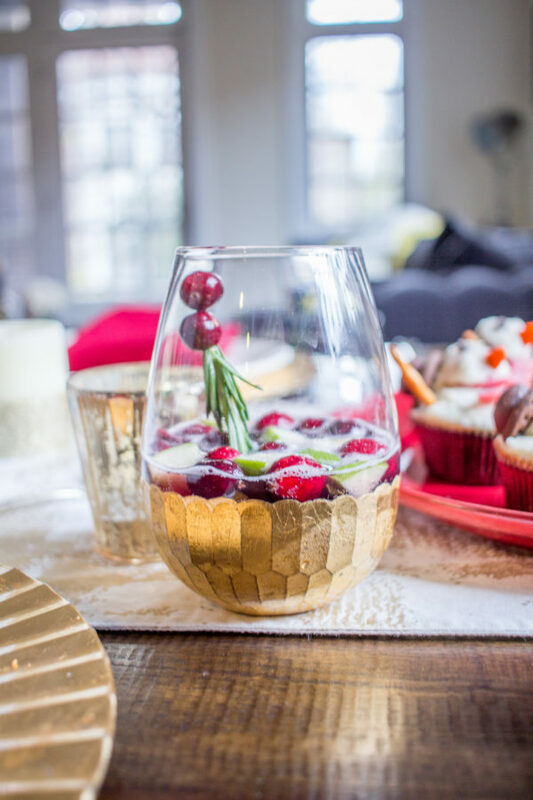 This is a recipe that I thought would be so easy to create, but it proved to be a challenge to create a mocktail recipe that mimicked the flavor of sangria without being too sweet. 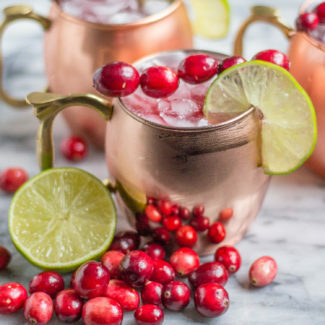 After several rounds of testing this recipe, I learned that the key to preventing the mocktail from tasting sugary is to use unsweetened cranberry juice and ginger beer. 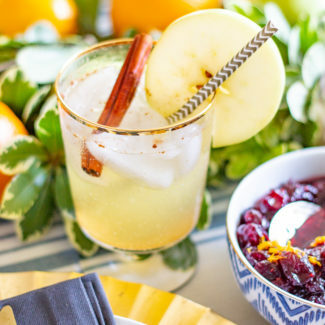 The bitter and tart flavors of the cranberry juice combined with the slight spiciness of the ginger beer balance out the sweetness of the apple juice, pomegranate blueberry juice, and fresh fruit. I know that the name ginger beer can be confusing. Ginger beer is non-alcoholic. You could use ginger ale instead, but ginger ale is sweeter and less spicy than ginger beer. Since the ginger beer is carbonated, don’t add it until you want to serve the sangria mocktail. The juices and fruit can be prepared in advance. If you want to turn this cocktail into a cocktail, that is easy! Just add a splash of vodka. Pour the cranberries and 1/2 cup of the cranberry juice into a small sauce pan. Bring to a simmer over medium low heat. Let simmer until the cranberries burst. It will become thick and syrupy. Pour into a pitcher. Slice the orange and dice the apple and add to the pitcher. Add the remaining cranberry juice, the pomegranate blueberry juice, the apple juice, and ice. Stir. Slowly add the ginger beer and serve. If making ahead, add the ginger beer and ice just before serving.